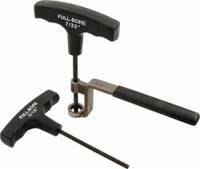 If you're looking for a valve adjusting wrench, Full-Bore Racing Products has you covered. Pit Stop USA is The Online Motorsports Superstore! We feature Full-Bore Racing Products. Full-Bore Racing Products offers products for the serious racer. 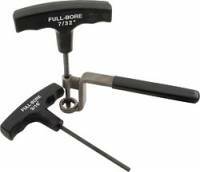 If you're looking for a valve adjusting wrench, Full-Bore has you covered. Full-Bore's Valve Lash Wrench makes life much easier, at least when you're adjusting your valves. How many times have you needed three hands to do the job? The high quality Full-Bore E-Z Wrench is made to last a lifetime. It's investment cast in 17-4 stainless steel and heat treated, then ball burnished to a satin finish. The Full-Bore Valve Lash Wrench is available in 5 popular sizes - 7/16", 1/2", 9/16", 5/8" and 11/16". We offer Full-Bore Racing Products at low everyday prices!